Fluorescence detection is a highly sensitive technique widely used in biotechnology, flow cytometry, medical diagnostics, DNA sequencing, forensics, and genetic analysis. Over the last 20 years, there has been a remarkable growth in the use of fluorescence in the biological sciences field due to the development of highly sophisticated fluorescent probe chemistries and the commercial availability of these probes and novel microscopy approaches. Enzo offers a distinctive combination of reagents comprised of exceptional fluorescent molecular probes including CELLESTIAL® dyes for visualization of live, fixed and permeabilized cells. Our portfolio includes products for drug discovery and research, dynamic intracellular analysis with high spatial and temporal resolution for target, pathway and cell signaling analysis, reactive oxygen and reactive nitrogen species (ROS/RNS) detection, apoptosis and cell viability, and organelle functional dynamics. Fluorescent probes, also referred to as fluorophores, only fluoresce when they are illuminated with light of the corresponding wavelength. When light is absorbed by a fluorescent molecule, it raises the energy level of the electron to an excited state. The excited electron remains in the high energy state for a very short time and returns to the ground state by releasing a photon. The emitted photon/light usually carries less energy and emitted light is always of a longer wavelength than the excitation photon. Fluorophore excitation and emission wavelengths are commonly abbreviated as the Greek letter lambda with a subscript "ex" (excitation) or "em" (emission λEX or λEM). The excitation and photon emission from a fluorophore is cyclical until the fluorophore has undergone irreversible damage known as photobleaching. Stokes shift is the difference in nanometers between the maximum excitation and emission wavelength of a given fluorophore. The emitted fluorescence thus can be distinguished from the excitation light. Fluorophores are categorized as organic, synthetic oligomer, protein, or multi-component system. In order to be able to select the most suitable label for a particular application, it is important to know the fluorescent properties. Fluorophores are characterized according to their absorption and fluorescence properties, including the spectral profiles, wavelengths of maximum absorbance and emission, and the fluorescence intensity of the emitted light. One of the most useful quantitative parameters for characterizing absorption spectra is the molar extinction coefficient denoted with the Greek symbol ε. This is a direct measure of the ability of a molecule to absorb light. A fluorophore’s brightness is defined by two parameters: its extinction coefficient and quantum yield. The extinction coefficient is a measure of the quantity of absorbed light at a given wavelength. Therefore, a high extinction coefficient will lead to a greater amount of light being absorbed. Quantum yield is the number of emitted photons relative to the number of absorbed photons. Quantum yields of fluorescent molecules commonly employed as probes in microscopy have quantum yields ranging from 0.05 to 1. In general, a high quantum yield is desirable in most imaging applications. The quantum yield of a given fluorophore varies, sometimes to large extremes, with environmental factors, such as metallic ion concentration, pH, and solvent polarity. Fluorophores with high quantum yields such as rhodamines, display the brightest emissions. Before selecting a label, it is important to define the type of experiment to be performed. Ideally, a fluorescent label should be small, bright, and stable, without any perturbation to the biological system. Furthermore, the label should be specific without the tendency to oligomerize and with the possibility to label multiple proteins at the same time. Fluorophores chosen for confocal applications must exhibit a brightness level and signal persistence sufficient for the instrument to obtain data. For many applications, it is preferable to use the longest possible wavelength for excitation. At longer wavelengths, there is less sample absorbance, less autofluorescence, and the light sources are less expensive. Although technological advances in fluorophore design have steadily increased, current fluorophores face challenges such as photobleaching, limited cell permeability, and strong background autofluorescence. However, scientists are developing near infrared (NIR) absorbing synthetic molecules emitting in visible light ranges. Red- and NIR-emitting probes are desirable for many applications of fluorescence. However, the red–NIR probes with high extinction coefficients and high quantum yields also display short lifetimes. Figure 1: The EQ dyes are a family of non-fluorescent dyes that are designed for fluorescence quenching in FRET applications. EQ quencher dyes are suitable as acceptors in fluorescence resonance energy transfer (FRET) applications due to their broad visible absorption but no detectable fluorescence emission. The use of fluorescent dyes to identify cell structural components and monitor cytotoxicity or cellular responses to growth signals is well established. In addition to a wide selection of gold standard labeling dyes such as DAPI, Hoechst, and JC-1, Enzo Life Sciences offers a wide range of useful fluorescent probes targeted to specific intracellular organelles such as the mitochondria, lysosomes, Golgi apparatus, and endoplasmic reticulum. We have translated our expertise in fluorescent probe chemistry and cellular analysis into our CELLESTIAL® portfolio of unique probe-based assays and reagents to meet the emerging needs of the life sciences and drug discovery markets. They are extremely useful tools for monitoring a variety of biological processes in living cells such as hypoxia, oxidative stress , apoptosis, autophagy, using confocal microscopy, flow cytometry and microplate assay. The assays can be performed in real-time, in solution, with high sensitivity. Other probes allow quantitative measurements calcium flux and zinc ions. A spectra viewer is available to determine the maximum excitation and emission wavelengths of the fluorophore. Every product is developed and reliably manufactured to provide sensitivity, specificity, and convenience. Figure 2: NUCLEAR-ID® Red/Green dye is detected as red-stained nuclei in live cells and fluorescent-green nuclei in dead cells (inset, arrow). Live (Red): Excitation: 568nm; Emission: 632nm; Dead (Green): Excitation: 503nm; Emission: 524nm (Left). 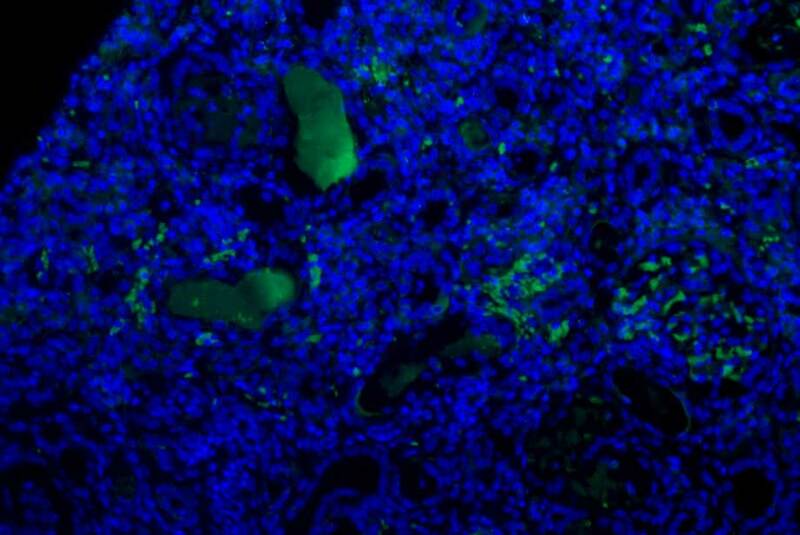 The NUCLEAR-ID® Blue/Green dye is detected as blue-stained nuclei in live cells and fluorescent-green nuclei in dead cells (arrows). Live (Blue): Excitation: 350nm; Emission: 461nm; Dead (Green): Excitation: 503nm; Emission: 524nm (Right). Check out our CELLESTIAL® Live Cell Analysis portfolio to learn more about specific technologies we offer. The CELLESTIAL® portfolio of conventional fluorescent molecular probes includes dyes extensively benchmarked for live cell applications. These probes facilitate analysis of subcellular organization and dynamics with high spatial and temporal resolution. Our EQ Quencher dyes are compatible with a wide range of Fluorescent Dyes. For further assistance or information regarding the products, please feel free to contact our Technical Support Team.